Shiv Krishnan, CEO, INDUS Corp. He arrived in 1979 fresh off a bachelor’s degree in chemical engineering from the University of Madras with $500 in his pocket. Today, he is a well-known figure in the federal contracting industry. Shiv Krishnan is chairman and CEO of INDUS, a federal information technology company he founded in 1993. Since arriving in the United States, Krishnan got his master’s degree in chemical engineering from Clarkson University, worked with several government and commercial IT providers, and even spent two summers improving his management skills at Dartmouth’s Tuck School of Business. WashingtonExec first introduced Krishnan back in 2011, but today we are back chatting with the industry executive about INDUS, how he thinks the industry will fare in 2013, what trends he has seen emerging, his time spent in Madras, organizations that helped him along the way, and more. “I think the real challenge is when you throw in words like sequestration, continuing resolution, and then an impending debt ceiling crisis and budget cuts. All of it combined is going to put a huge stress on spending by the federal government on contracts. With changes in technology, the government is also going to be looking at how they can save on resources and operate within a lower budget regime, which is going to introduce additional uncertainty and delays in awarding contracts. In specific, Krishnan points to a trend called “lowest price, technically acceptable (LPTA) contract awards,” that INDUS “has been looking at over the last year or two that the government uses on several of the procurements.” What Krishnan and his company like to focus on is “LPTE” or lowest price, technical excellence. “You have to look at technology as an enabler. When our country is faced with budgetary challenges, you cannot expect to solve the problems by throwing more and more people at it,” Krishnan said. “We’ve got to work smarter. We’ve got to leverage technology. So in the wake of uncertainty, challenge, and delay, how does a small business survive and grow? Krishnan said that with INDUS, which became a large company about a decade prior, he always preached that one “cannot survive by wanting to be a small business or only taking advantage of all of the small business opportunities that are out there. If a company needs to prosper they have to from day one start thinking about how they are going to survive and grow as a business as opposed to being just a small business. So the constant vigilance and desire for growth is vital. So is having the best management team and building business development processes. And according to Krishnan, he has abided by three specific principles that have helped him rise above the challenge and get him to where he is today. When he’s not running INDUS, Krishnan is busy focusing on giving back to the small business community as the founding Board member and immediate-past Chairman of the Small and Emerging Contractors Advisory Forum (SECAF). 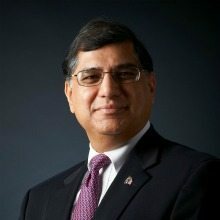 He also serves the Washington business community being an active Board member of the Professional Services Council, member of the Fairfax County Chamber of Commerce, Northern Virginia Technology Council, and the Association for Corporate Growth, organizations Krishnan credits as being beneficial in INDUS’ growth. He’s also on the Board of Wolf Trap. So does Krishnan ever go back home to Madras? He tells us that while he hasn’t been back in about six years, his daughters really want to go this year. As far as his wife Meena goes, Shiv says both he and his wife are staunch education advocates, in addition to Meena’s focus on strategic growth initiatives for INDUS. “Outside of her leadership at INDUS, Meena does a fabulous job on several Science, Technology, Engineering, and Math (STEM) initiatives, especially dealing with the schools and helping the younger generation become future leaders of STEM. Meena is working with J.D. Kathuria and WashingtonExec in spearheading a stronger STEM initiative targeted at the Washington business community to strengthen our next generation,” Krishnan said. “We both have been involved in education for a long time and we believe that change has to happen at K-12 or in fact K-6 – that is where you need to get these kids involved. Krishnan concluded saying that education is an area that needs continued support from the community.